A British journalist and historian examines Scotland’s movements for home rule and independence—not necessarily conjoined—and illuminates their tangled roots. Ascherson (Black Sea, 1995, etc.) sees the politics of Scotland, old and ongoing, beset with what he calls “St. Andrew’s fault”: the divide between a tentative, nonassertive majority perennially jostled, admonished, and sometimes inspired by an assertive minority that is usually exhorting “patriotism” to people unsure whether they live in a nation, an underprivileged colony, or some kind of artifact. What all should grasp, Ascherson believes, is that the urging for collective freedom, a.k.a. nationhood, is a rare Scottish continuum in an otherwise turbulent, chaotic, and often violent history. For those who apprehend it, the message can seem as old as the myriad standing stones left behind by a Neolithic culture, but it’s not that easy to learn a history rent over centuries by the worst kind of religious repression and political revisionism, whether in collusion with England or by Scots factions acting on their own. 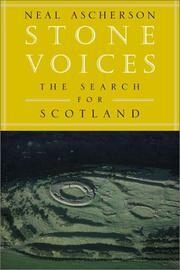 Even today, the author argues, Scottish history gets short and “less coherent” shrift even in Scotland’s own schools. Ascherson does his best to provide remedial thinking, explaining why England’s return of the Stone of Scone (as a “loaner”) was greeted by a mass shrug, why having their own Parliament (since 1999, facing initial reelections this year) makes some Scots uneasy, and why Scots surprised even themselves by celebrating Mel Gibson’s Braveheart, which portrayed 13th-century patriot William Wallace. The tone is mostly affectionate and informed, except when, say, Margaret Thatcher is painted as a 20th-century Longshanks who hammers the Scots with economic policies that gut linchpin industries like mining and steel. For this and other reasons, it’s Ascherson’s hunch that Scotland will someday depart the UK for its own rendezvous with Europe. Greatly accessible compendium of scholarly passion.